On June 29, NASA's Juno probe snapped one last picture of the Jupiter system before switching off its instruments in preparation for today's (July 4) daring dive through the planet's hellish radiation field. The image was taken at a distance of 3.3 million miles (5.3 million kilometers) from Jupiter, but eventually Juno will send back images taken at much shorter distances — the probe is expected to fly to within 3,100 miles (5,000 km) of Jupiter's cloud tops, a closer orbit than any other probe before it. But before Juno can make history, it has to get into orbit around Jupiter. That nail-biting event happens tonight, when Juno slows down and makes its first pass between Jupiter's cloud tops and the belts of intense radiation that surround the planet. During this first close approach, all of Juno's non-necessary instruments are shut off. Juno will perform the maneuver on autopilot, so scientists on the ground can only wait to find out if the probe succeeded. They should know by 11:53 p.m. EDT (0353 GMT Tuesday) if the burn went as planned. NASA's Juno spacecraft captured this image of Jupiter and its four big Galilean moons on June 21, 2016, at a distance of 6.8 million miles (10.9 million kilometers) from Jupiter. Juno snapped another image of Jupiter on June 21, at a distance of 6.8 million miles (10.9 million km) from Jupiter. 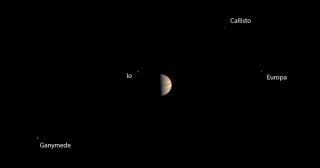 Comparing the images reveals that Jupiter is growing larger and more focused in Juno's view, and the planet's four large Galilean moons (Callisto, Europa, Ganymede and Io) have moved in their orbits. Based on the time between when the two images were taken, Juno covered about 3.5 million miles in just over a week. Just before entering into orbit around Jupiter tonight, the Juno probe will reach speeds of about 165,000 miles per hour (265,000 km/h), faster than any other man-made object in history, according to mission team members. Juno principal investigator Scott Bolton, of the Southwest Research Institute in San Antonio, spoke during a media briefing on NASA TV today about how quickly Juno is approaching the giant planet. "We passed Calisto yesterday at about 11 a.m. [Pacific time]," Bolton said. "Ganymede was next; that happened last night at about 4 a.m. In about an hour and a half, we will pass Europa … And then later this afternoon, a little after 2, we will pass Io, the innermost moon of the Galilean moons. And so we're headed there. It's happening."